The Imam Mosque is situated on the south side of this square. On the west side you can find Ali Qapu Palace. Sheikh Lotf Allah Mosque is situated on the eastern side of this square and the northern side opens into the Isfahan Grand Bazaar. Today, Namaaz-e Jom'eh (the Muslim Friday prayer) is held in this square in front of the Imam Mosque.Naghsh-e Jahan Square (Design of the world) officially known as Imam Square, situated at the center of Isfahan city, Iran. It is an important historical site and one of UNESCO's World Heritage Sites. The square is surrounded by buildings from the Safavid era. Situated on the eastern side of Naghsh-e Jahan Square, Sheikh Lotfallah Mosque was constructed between 1602 to 1619 A.D. in Shah Abbas (I)'s era. The monument's architect was Mohammadreza Isfahani. He solved the problem of the difference between the direction of kaabeh and gateway of the building by devising a connecting vestibule between the entrance and the enclosure. Ali Qapu (pronounced, ah-lee gah-pooh) is in effect but a pavilion that marks the entrance to the vast royal residential quarter of the Safavid Isfahan which stretched from the Maidan Naqsh-e-Jahan to the Chahar Bagh Boulevard. The name is made of two elements: "Ali", Arabic for exalted, and "Qapu" Turkic for portal or royal threshold. The compound stands for "Exalted Porte". This name was chosen by the Safavids to rival the Ottomans' celebrated name for their court: Bab-i Ali, or the "Sublime Porte"). The building, another wonderful Safavid edifice, was built by decree of Shah Abbas the Great in the early seventeenth century. It was here that the great monarch used to entertain noble visitors, and foreign ambassadors. Shah Abbas, here for the first time celebrated the Nowruz (New Year's Day) of 1006 AH / 1597 A.D. A large and massive rectangular structure, the Ali Qapu is 48 meters high and has six floors, fronted with a wide terrace whose ceiling is inlaid and supported by wooden columns. Ali Qapu is rich in naturalistic wall paintings by Reza Abbassi, the court painter of Shah Abbas I, and his pupils. There are floral, animal, and bird motifs. The highly ornamented doors and windows of the palace have almost all been pillaged at times of social anarchy. Only one window on the third floor has escaped the ravages of time. Ali Qapu was repaired and restored substantially during the reign of Shah Sultan Hussein, the last Safavid ruler, but fell into a dreadful state of dilapidation again during the short reign of invading Afghans. Under the Qajar Nasir al-Din shah's reign (1848-96), the Safavid cornices and floral tiles above the portal were replaced by tiles bearing inscriptions. On the sixth floor, the royal reception and banquets were held. The largest rooms are found on this floor. The stucco decoration of the banquet hall abounds in motif of various vessels and cups. The sixth floor was popularly called (the music room) as it was here that various ensembles performed music and sang songs. From the upper galleries, the Safavid ruler watched polo games, maneuvers and horse-racing below in the Naqsh-e-Jahan square. The Ali Qapu building was founded in several stages, beginning from a building with a single gate, with entrance to the government building complex, and gradually developed, ending in the existing shape. The period of the development, with intervals lasted approximately seventy years. Fifth Stage: Foundation of the wooden ceiling of the verandah, supported by 18 wooden columns, and contemporaneous with erection of the ceiling, an additional stairway of the southern flank was founded and was called the Kingly Stairway. Sixth Stage: During this stage a water tower was built in the northern flank for provision of water for the copper pool of the columned verandah. Plaster decorations in reception story and music hall. The room on the sixth floor is also decorated with plasterwork, representing pots and vessels and one is famous as the music and sound room. It is certainly well worth visiting for the cut out decorations round the room, which represent a considerable artistic feat. These cut out shapes were not placed there to act as cupboards: the stuccowork is most delicate and falls to pieces at the highest touch. So we conclude that it was placed in position in these rooms for ornament and decoration. The rooms were used for private parties and for the King's musicians, and these hollow places in the walls retained the echoes and produced the sounds of the singing and musical instruments clearly in all parts. Fortunately the ceilings, on which birds are depicted in their natural colors, have remained without interference in their original state from Safavid times, and these are the best roofs in the building. Imam Mosque is a mosque standing in south side of Naghsh-e-Jahan square. Built during the Safavid period, an excellent example of Islamic Architecture in Persia (Iran). 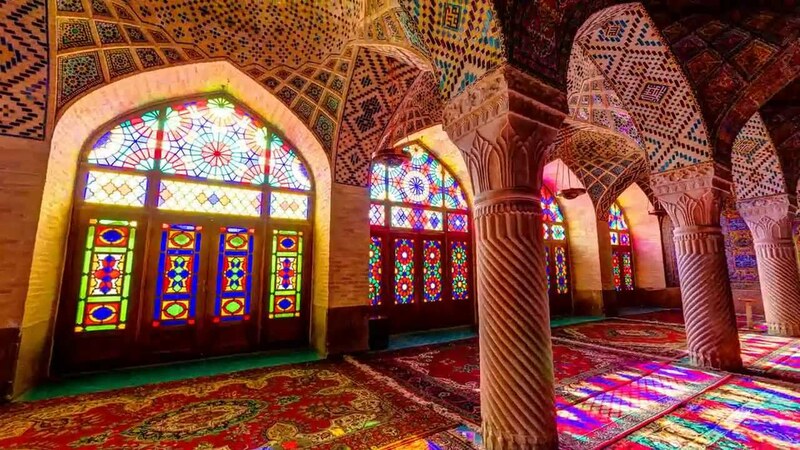 This mosque has been constructed during the Safavid period, in 1611 with seven-color mosaic tiles and valuable inscriptions. The portal of the mosque measuring 27 meters high, crowned with two minarets being 42 meters in height, frames the front of the mosque which opens into Naqsh-e Jahan square. On top of the entrance, among the stalactites and above the turquoise lattice window, there is a frame of seven-color mosaic tile shaped like a vase with two peacocks on both sides which is an example of mosaic tile. The inscription above the entrance being made of white mosaic tile on ultramarine background is written in Sols script by Alireza Abbasi. The wooden door of the mosque, covered with layers of gold and silver, is ornamented with some poems written in Nasta'liq script. The overall entrance hall proves the mastery of the designer of the building. The master architect has designed two passageways being different in length on both sides of the hall to assimilate the axis of the mosque to the direction of kiblah which has an angle of 45 degrees, to cover the change of direction without losing the proportions. The Mosque is surrounded with four ivans and arcades. All the walls are ornamented with seven-color mosaic tile. The ivan of the mosque is the one which is toward kiblah measuring 33 meters high and has two minarets being 48 meters high. Behind this ivan is a space which is roofed with the most enormous dome of the city being 52 meters high. The dome consists of two covers. The outer cover is 12 meters away from the inner one. There are two schools for religious education at the southwest and southeast of the mosque. The southwest school has an inscription from the Safavid period. There is also an indicator stone, inserted in the inscription, the shape of which is right-angled triangle. This stone shows the mid-day of all the days of the year scientifically in a simple way.